The RS Watanabe FORGED Mg are lesser known JDM Wheels from the wheel maker. The RS Watanabe FORGED Mg feature lightweight Magnesium construction and a simple 10 spoke design. 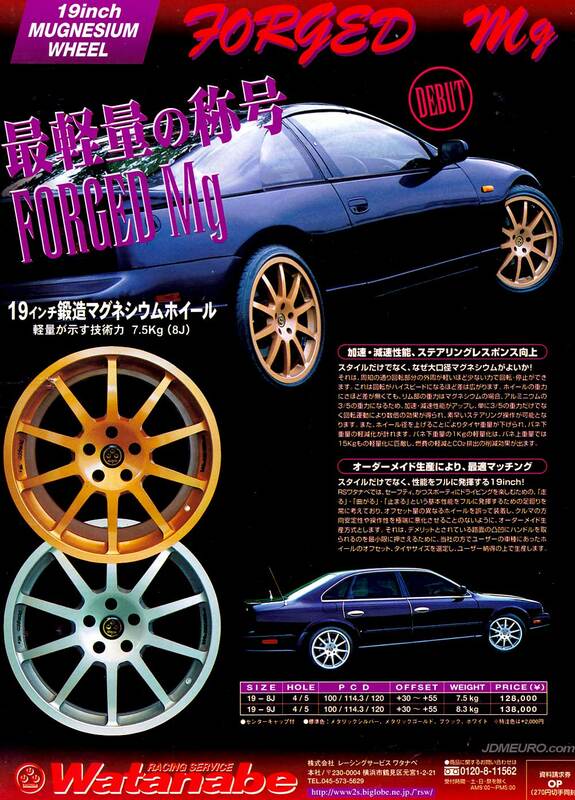 The RS Watanabe FORGED Mg were available in silver and gold and in 19×9 and 19×8 wheel sizes. The wheels also have a hefty price tag of about $1200 per wheel 20 years ago which could roughly be $2000 a wheel in today’s economy. Pictured are the RS Watanabe FORGED Mg on a Nissan 300zx Z32 and on a Nissan President G50; the JDM eqivalent of the Infiniti Q45 G50.